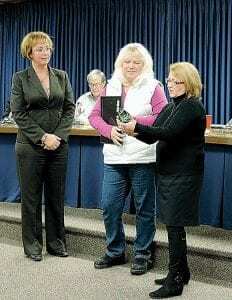 Supervisor Karyn Miller and Clerk Kim Courts present a proclamation and retirement gift to Deb Gorey. FLINT TWP. — August 5, 1985: Ronald Reagan was president of the United States, Genesee Valley Mall had just celebrated its 15th birthday and Carman and Ainsworth still were separate high schools when Deb Gorey started her first day on the job as an administrative clerical employee. Twenty-eight years later, Gorey is calling it quits and was cited for her years of service with a proclamation and parting gift from the Flint Township Board. Gorey served as secretary to former Township Supervisor Galen Jamison, according to the proclamation. She later worked in the clerk’s office, treasurer’s, sewer and water, accounting, police and building departments. She served as a deputy clerk to Cathy Bevil and a deputy treasure to Sandra Wright. Since October 2007, she has been the administrative assistant to the director of the Genesee Auto Theft Investigation Network (GAIN). She’s worked as a leader of AFSCME Local 1918-01 and as a mentor to fellow union members. She’s volunteered with many charitable organizations including the American Cancer Society, Big Brothers/Big Sisters of Genesee County and the Crim Festival of Races. Gorey was accompanied by her husband, Joe, at the board presentation last week.